At initial glance Henri-Georges Clouzot’s The Murderer Lives at 21 (L’Assassin habite au 21, 1942) would appear to be mere comic folly from a director highly respected for serious thrillers. Arriving on Blu-ray in Eureka’s Masters of Cinema series, its television-style whodunnit set up, cast of oddball suspects and humorous tone all point towards a light and less abiding affair. This markedly assured debut may be those things, but it is equally shot through with a delightfully noirish streak and an abundance of misanthropic undertones, not least in the banal shadows within which evil is lurking. The opening scene provides us with a fiendish moment of complicity in which the film’s antagonist, Monsieur Durand, stalks an inebriated lottery winner. The audience isn’t privy to the villain’s identity through this sequence but instead finds itself observing from Durand’s point of view as he slays the man, takes his money and leaves a calling card. Inspector Wens (Pierre Fresnay) has been on the case for some time and sets out to apprehend the roguish killer having traced him to a salubrious boarding house. Disguised as a pastor, he takes a room in the hope of cornering his prey. Little does Wens know that his girlfriend, Mila (Suzy Delair), has set out to do the same in order to kick-start her singing career. With every one of The Murderer Lives at 21’s absurd and entertaining moments – the matriarch’s manservant speaking largely in bird calls – comes a darker flash such as the doctor’s proclamation that the killer is doing a community service. As the investigation reaches its conclusion, the darker aspects of motive and opportunity come to the fore and the seemingly generic plot’s ability to keep audience’s is suggestive of the directors illustrious future. Still, the film is largely a comedy and enjoyment of the piece is likely to hinge on this aspect. Luckily, Fresnay and Delair provide some crackling repartee almost reminiscent of screwball comedy, although it should be noted that Delair will likely grate as many as she charms. 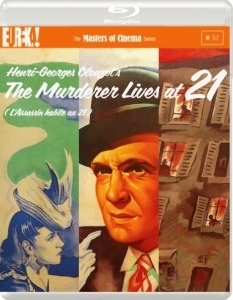 Especially with the remainder of his oeuvre for comparison, The Murderer Lives at 21 is no masterpiece. Still, with this in the lovely transfer it makes for enjoyable viewing and adeptly signalled the arrival of M. Clouzot with regards to both well-handled direction and the injection of deliciously sinister tone.